We have delivered three Culture Shift programmes in Lagos, Nigeria from 2012 -2014, bringing together a soiree of creative practitioners with some of the city's best digital developers to experiment together. Lagos is a hotbed of creative talent, with a variety of hubs acting as creative catalysts dotted amongst its bustling city centre. However, there are very few opportunities that allow for serendipitous collisions to take place. Enter, Culture Shift, the perfect vehicle in mixing things up and presenting new ways of collaborating. 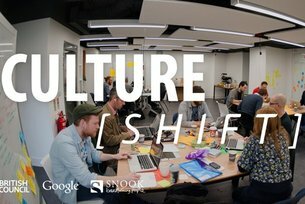 Culture Shift 3 - The Hackathon from Snook on Vimeo. We delivered the programme as a pilot in 2012, looking at ways that creative and cultural practitioners could work with digital innovators to design new ICT tools for the organisation and management of festivals. Andy Young of Snook and Kelly Clark of Marmanie were instrumental in the development of the initial programme in Lagos. We then delivered a second Culture Shift in 2012 and a third across 2013/14 incorporating ideation workshops (bringing people together and understanding problems), hacks (the great 48 hour creative embargo) and pitching opportunities (to enable the support and development of the most compelling solutions). Our partners across both were Snook and Social Innovation Camp, along with our local partner, CCHub. Our judging panels were made up of: Harry Robbins (Outlandish), Subomi Plumptre (Alder Consulting), Kunle Olaifa (Samsung West Africa), Tunji Eleso (CCHub) and Akin Adesola (The Newton Project Room). For both iterations of the programme, we put together six groups, made up of approximately 10 developers, UX & UI designers, marketing experts and business gurus. Each group was assigned to a particular business that required innovative solutions or new digital platforms. Then the great 48 hack would begin! We offered three cash prizes (N800,000 / N500,000 / N300,000) in order to fund and incubate the development of the best three ideas. First Place - Trybe records, who developed an app to download and follow their musicians. Second Place -Lufodo Academy, a new platform to revolutionise the Nollywood recruitment process and inject new life and professionalism into the community. Third Place - L'Espace team whose bespoke customer and events management platform promised their business a great opportunity for growth. Third Place - Fetch Strategic Insights, who are creating a representative library of African picture stock. Culture Shift Athens - the winners! Our latest Culture Shift in Athens was a huge success - and saw the developers of a new cultural event app winning an exclusive residency with Google HQ in London.